Today I joined John, Louise and Alison for a nice paddle from Roberts bay and out around Coal island. I hesitate to call it a circumnavigation, but we did a big circle around the island. 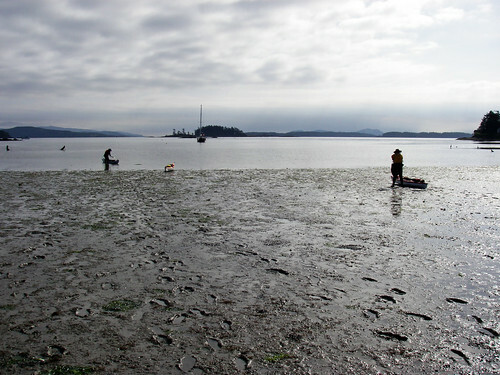 We arrived at Roberts bay to a very low tide and a brilliant, sunny day with only a little haze from the morning air. We slopped our kayaks down to the beach and poled our way out of the shallows. We planned to go clockwise around coal island today to us the last of the ebb to bring us home. We crossed the busy lane at Tsehum harbour and kept to the east short of page passage, a little passage filled with islands and islets. 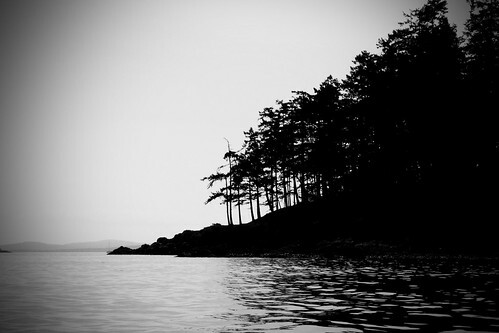 We were drawn into this passage by the looks of a little islet called "Rose Rock." To explain rose rock, take a round piece of rock and just fill it with trees. It's a neat little bit of geology. There were some currents near shore, but overall they were just the last little bit of noisy water before low tide. The place was windswept and full of dilapidated buildings and boats. 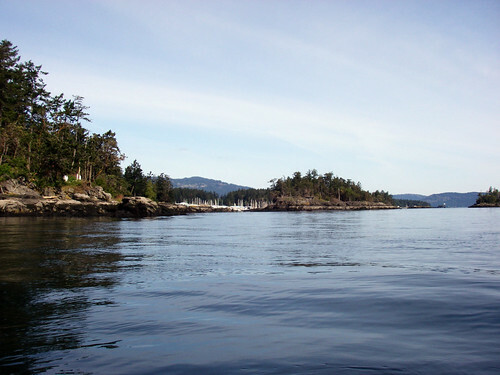 we turned just south of Goudge Island and headed toward Coal Island's west side. 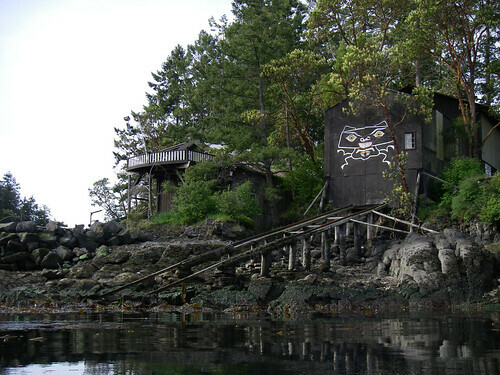 As we turned around the point we noticed a strange building with some graffiti on the front... Alison thought: "Haida styled graffiti" I thought "ancient flying spaghetti monster prototype." Just past this little building was a really interesting intertidal zone that looked more or less like a gravel pit at low tide. This is a place I'd like to come at an extreme high tide just to see if you could get in there in a kayak. We had more weird current/rogue wake coming through the passage and it got even weirder as we headed into John Passage. 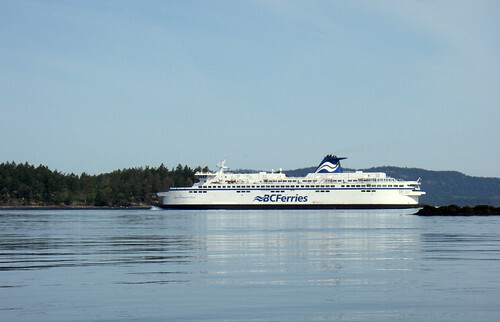 As we neared the exit of John passage we saw the ferry terminal to port and the ferry crossing toward it from the east. The rocks north of Carney point were exposed and full of seals sunning themselves. They gave me indignant dirty looks and dropped in the water. Didn't see any pups, just big, black and white adults. We headed North along Lewis bay and more seals were coming up and flapping around before diving. Just near the cable marker, we saw a rodent going about its business, may have been an otter? Not sure what lives out there. The wind picked up as we rounded the north point of Coal, but it was a very non threatening day overall. Very little current and gentle swells. The photo above is Charmer point and an example of the rugged coastline at the points of a lot of these islands. Coal Island was nearly rounded, so we hopped on over to the little group and had a little rest stop at the east point of Ker Island. The current and gentle tailwinds whisked us back to the beach where the tide level had changed very little from the morning. 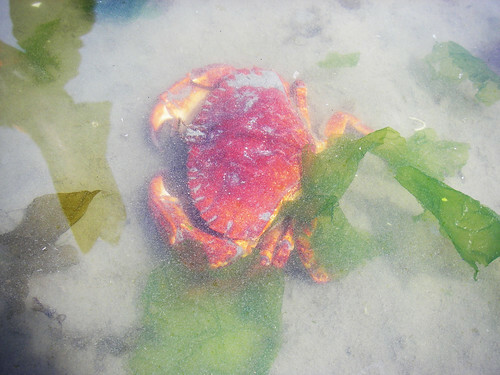 We found some delicious inhabitants in the muddy sands at the beach. It was time for lunch, but we left the crab alone.